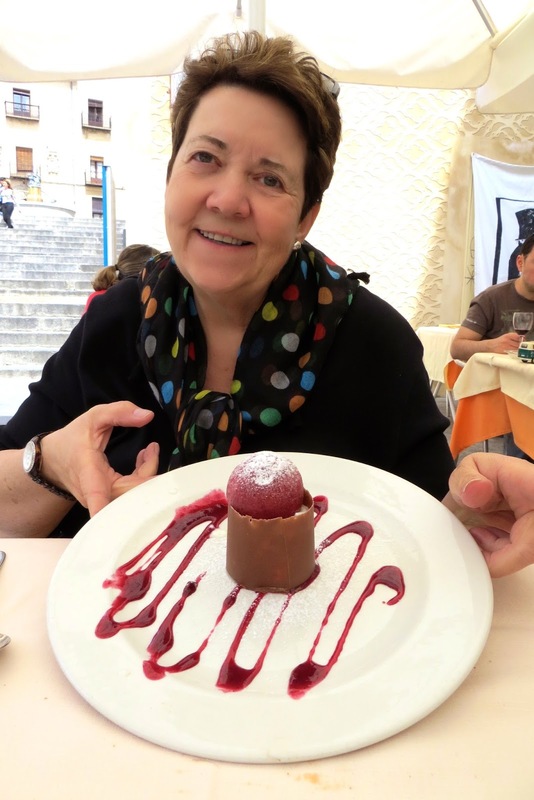 The Travelin' Lundburys: Hola from Sunny Segovia, Spain! After the usual "long and uneventful flights" from Spudville, we arrived in Madrid right on time at 8:30 am. Passport control and customs were a breeze, and soon we were in a taxi on our way to Chamartin train station in downtown Madrid. Buying train tickets was a bit of a challenge, and my very rusty Spanish language skills didn't help much--but we managed! We had about an hour wait until the next train to Segovia, so we found a nice little cafe and each had a small beer. And yes, I realize it was only 10 AM--but our body clocks were firmly set for about 4:30 PM, so we figured it was just fine. I did have a coffee chaser, though! Our train ride from Madrid to Segovia was F-A-S-T! This was the first time we've been on a true high speed train--and it was a smooth ride. At one point in our 27 minute journey, we noticed a speed of 224K per hour--a little over 139 miles per hour! 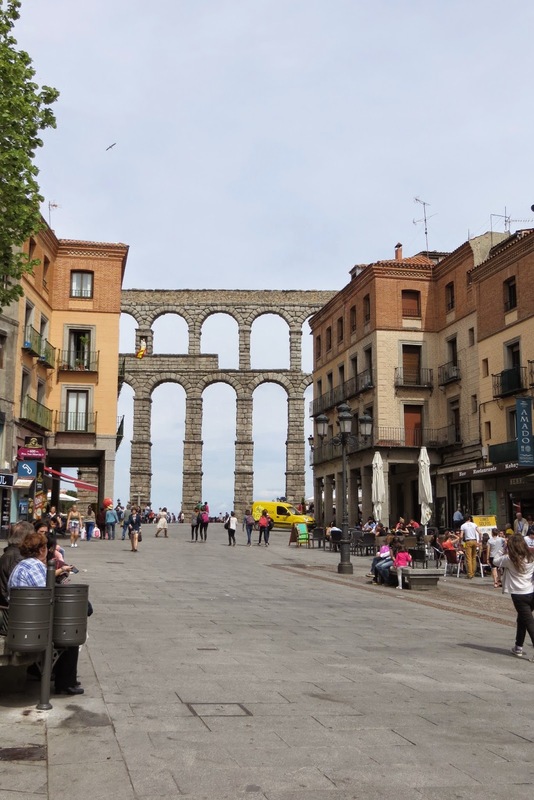 The Segovia train station is a few miles out of town, so we took a taxi to our hotel. 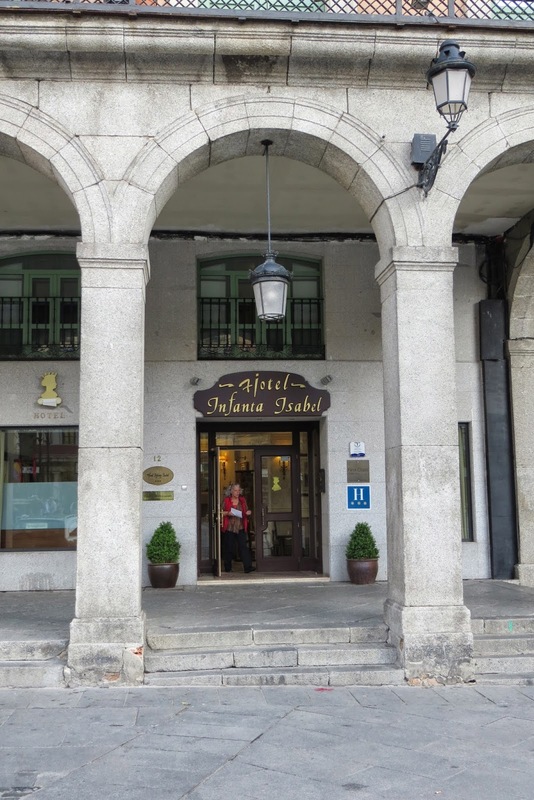 We're staying right in the very center of town, and the Hotel Infanta Isabel is right on the Plaza Mayor. After we got settled we set off to explore and find a cafe for lunch. Of course, we chose a small cafe with outside seating! The view from our table--wonderful! We each had the Menu del dia, and chose different dishes so we could share. I had beer glazed pork medallions--very good and melt in your mouth tender. For dessert David chose the apple tart, which was served with a very rich caramel sauce--yummy! Although both of our lunches were delicious, my dessert was the BEST! A creamy, delicious and very rich yogurt custard in a chocolate cup, topped with a raspberry sorbet---mmmmmmm so good! The other "best" part of menu del dia: the wine! Each restaurant has bottles of their own house wine, and they open a new one for each table! One can have a glass each---or the whole bottle, the price is the same and included with the menu del dia. 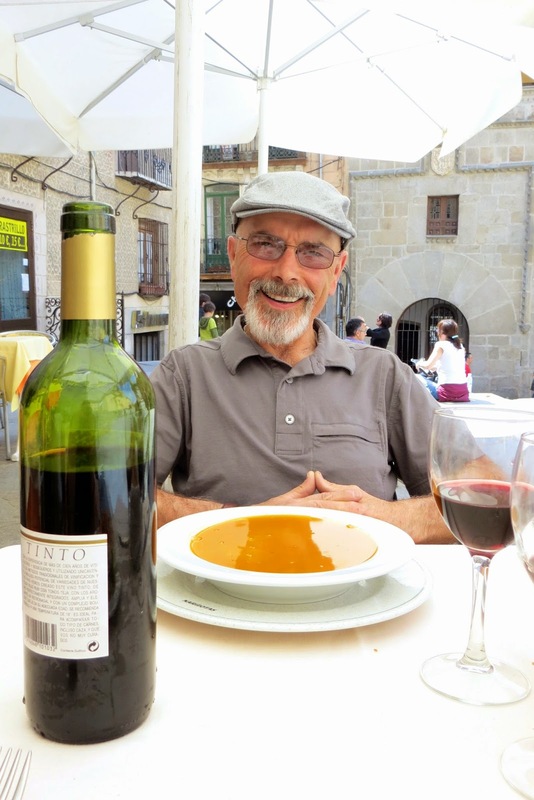 We chose the vino tinto (red wine) and it was delicious. This could be dangerous! After that leisurely lunch and a couple of glasses of wine, we were getting sleepy. 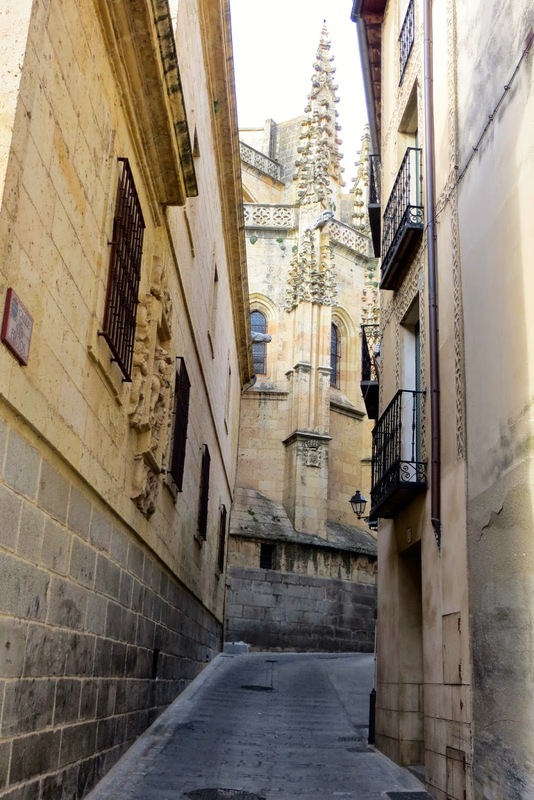 We were determined to stay awake for a few more hours, so we decided to walk around the charming streets near the plaza. We managed about a half hour of exploring--and then we gave up. Serious jet lag had set in, and it was siesta time for these two weary travelers. We slowly made our way back to our hotel and we slept for almost 2 hours! The amazing and beautiful Acuaducto de Segovia, it's really T-A-L-L! After a couple of hours of exploring, we could feel ourselves fading again--and we knew we'd not last until 8 or 9 PM dining time. We found a small sidewalk cafe near our hotel, relaxed with a nice cold beer. We ordered sandwiches to go, bought a bottle of nice Spanish wine, and stopped by the bakery across from our hotel for dessert. A little in room picnic for dinner--just perfect! 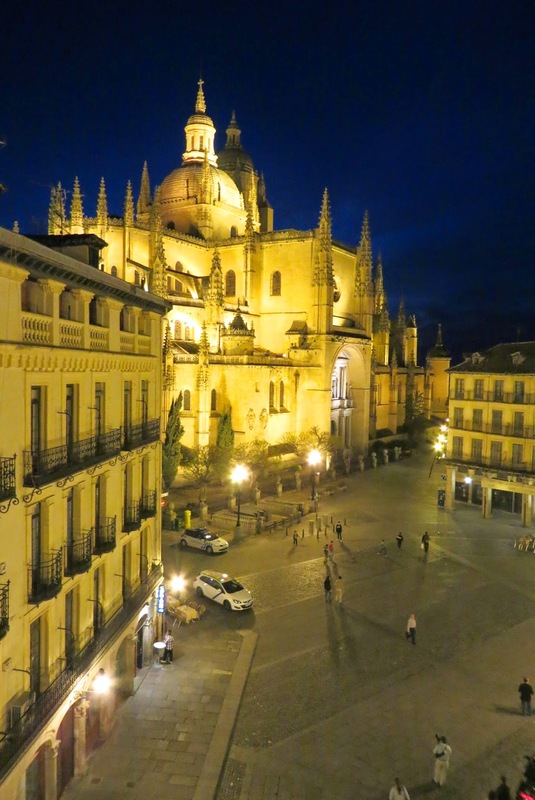 It was an early night for the Travelin' Lundburys……..
Good night from beautiful Segovia! 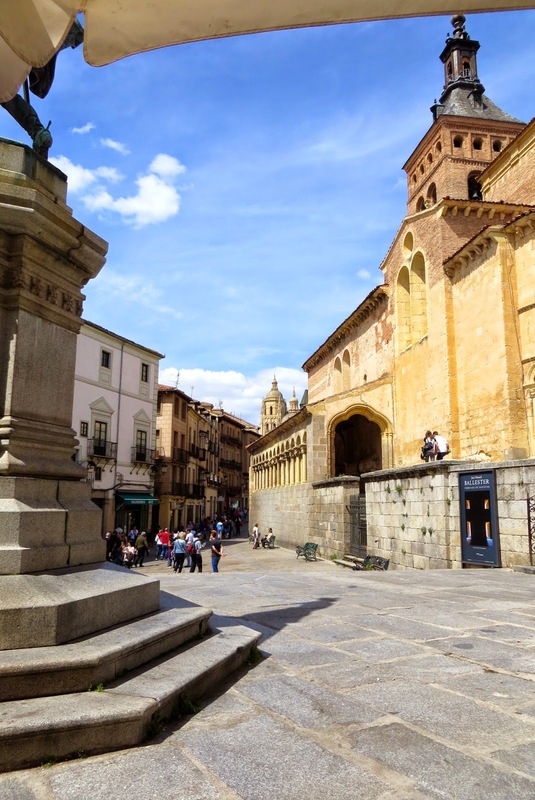 Tomorrow in Segovia: A visit to the Cathedral and the Alcazar. Beautiful pictures and this is only the beginning of your adventure. Yummy, the food sounds delicious and so do the desserts. Beautiful first day. Enough room in that bed for me! Enjoy your walks around the city is looks amazing so far!